Verna Johnson, 94, Thief River Falls, MN went to be with the Lord on Tuesday, October 9, 2018 at Valley Home, Thief River Falls, MN with her loving family by her side. Funeral service will be held at 5:00 PM on Sunday, October 14, 2018 at Johnson Funeral Service in Thief River Falls, MN. Visitation will be held from 3:00 PM until 5:00 PM on Sunday at the funeral home. Burial will be held at Birchwood Cemetery, Swan River, Manitoba, Canada at 11:00 AM on Sunday, October 21, 2018. Verna (Leggett) Johnson was born June 24, 1924 to Tom and Beth (Dieffenbaugh) Leggett in Swan River, Manitoba, Canada. She was predeceased by her parents and her 4 siblings: Frank Leggett, Vivian Krumm, Edith Armstrong, and Tom Leggett, Jr.
Verna married Lloyd Brundage on March, 19, 1943 and together they had eight children and 24 very happy years together, before Lloyd was called home to Heaven on January 12, 1967. Verna was predeceased, by 12 hours, by her eldest son, Lloyd Wayne Brundage (Sonja) on the evening of Oct 8, 2018 in Sundre, Alberta. Her surviving children are Judi (the late, Stephen) Newcomer of Toronto, Ont; Bunny (Bob) Goertzen, Winnipeg, MB; Lorraine (Bill) McBride, Tottenham, Ont; Grace (Leo) Thompson of Wasaga Beach, Ont; Doug (Anna) Brundage of Toronto, Ont; Sid (Verna) Brundage of Coe Hill, Ont; and Beth (Keith) Wheeler of Thief River Falls, MN. 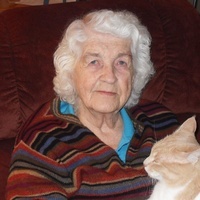 Verna moved to Toronto, Ontario following Lloyd's death and lived there for six years before marrying Roy Brown and moving to Thief River Falls, MN, in 1974. Roy was called Home in 1988. Verna married Oscar Johnson in 1990, in Thief River Falls. Oscar was called Home in 2003. Verna was a loving wife, mother, and grammie. She was known as a compassionate caregiver to many people over the years, in her role as a personal care worker and as a friend. She was known for her hospitality and was a legendary cook and baker. She was very creative and gifted in sewing and knitting and she grew beautiful flowers in her gardens. In addition to her eight children, Verna is survived by her step-children whom she held very dearly: Pat (Lowell) Anderson of Glencoe, MN and step-granddaughter, Stephanie (Jay) Eckel of Eagle Bend, MN. Larry (Sue) Johnson of Owatonna, MN; Marvin Mikkelson (Mary) of Fridley, MN; Paul (Geno) Johnson of Thief River Falls, MN, 6 step-grandchildren and 13 step-greatgrandchildren. Verna treasured her grandchildren and is survived by: Tim (Janice) Brundage, Bert (Donna) Faulkner, Blair (Liz) Faulkner, D'Arcy (Corrie) Newcomer, Candice (Eric) Metcalf, Calvin Goertzen, Rhonda (Tom) McKnight, Jeff (Liza) McBride, Brett (Stephanie) McBride, Kathryn Brundage, Marianne (Tristan) Brundage, Beth Brundage, Tina (Jay) Brundage, Alli (Andrew) Molden, and Lindsay (Erick) Peterson. She was predeceased by grandsons Kerry Goertzen and Daryl Goertzen. She is also survived by 25 great-grandchildren and great great-grandchildren; and many nieces and nephews. She derived immeasurable joy from her great-grandchildren who lived nearby, Gwynnie, Espyn, Addy & Signy Molden. Her family wishes to thank the staff at Valley Home. Each person there cared for her with compassion and dignity and we will always be grateful.